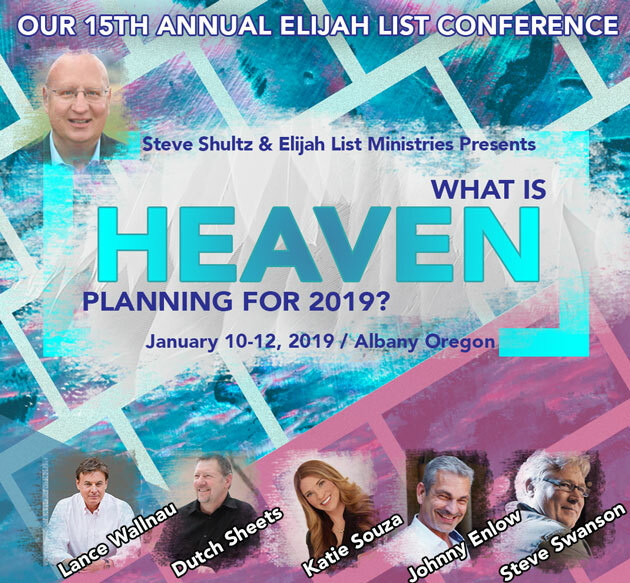 We are pleased to announce our 15th annual Elijah List Ministries conference "What Is Heaven Planning for 2019?" As it has been for years now, this is such an incredibly important and intense time in history, so you need to reserve your spot at this event before it fills up! If you tried to register last year, you know what I mean... we sold out weeks before the event. It's the same great conference we have every January with a new name. This year's guest speakers are Lance Wallnau, Dutch Sheets, Katie Souza, and Johnny Enlow... with worship by Steve Swanson and the Jesus Pursuit Church Worship team! These featured speakers will provide the very meaning of what is Heaven REALLY PLANNING for the upcoming year of 2019. As I mentioned above, we sold out early last year, and many people were turned away who waited until the last week or 2, or thought they could get in without pre-registering and just came to the venue thinking they would be able to get inside. We HATED having to turn people away, but once the venue is full, we can't take any further registrations. We expect this year to be full again (maybe even earlier this time), based on the things we are seeing in the news, in politics, and in Biblical prophecy. The accuracy level of these prophetic voices have always been very high concerning what God is about to do, and it gets more accurate each year. Plan now to be here in Albany, Oregon with us – your prophetic family – for a prophetic look at what Heaven is planning for 2019! This event will fill up fast! To Register, CLICK HERE, or call 541-967-3665. See you here January 10th, 11th, and 12th, 2019! Jesus Pursuit Church is on the left about 1 mile from exit, right behind Advance Auto Parts. Dr. Lance Wallnau has shared platforms with best-selling authors Ken Blanchard and John Maxwell, and lectured at universities from Harvard and M.I.T. to the London School of Theology. Merging a thirty-year background consulting in business and the non-profit sector, Lance inspires visions of tomorrow with the clarity of today, connecting ideas to action. His students represent a tapestry spanning nations and spheres: from politicians, to CEO's, entertainers and entrepreneurs. He currently directs the Lance Learning Group, a strategic teaching and consulting company based in Dallas, Texas. Dutch Sheets is an internationally recognized author, teacher, and conference speaker. Dutch has pastored, taught in several colleges and seminaries, and served on the board of directors of numerous organizations. Seeing America experience a sweeping revival and return to its Godly heritage is Dutch's greatest passion. He is a messenger of hope for America, encouraging Believers to contend for awakening in our day and reformation in our lifetime. Dutch has written over 20 books. His bestseller, Intercessory Prayer, has sold over 1 million copies worldwide. Dutch and his wife Ceci have been married for 37 years, and they treasure time with their two grown daughters, son-in-law and grandchildren. Katie Souza was a career criminal most of her life, was convicted of a number of felonies and sent to federal prison to serve almost twelve years. While serving what would be her final prison sentence, Katie encountered God in a way that dramatically changed her life. She immediately became an outspoken advocate for Jesus and her infectious love for Him caused many women inside her cell block to accept Him as their Savior. Johnny Enlow is driven by a desire to help people see God as big and as good as He really is. He has a passion for breaking religious mindsets. He loves cheering for underdogs and bragging on God. You'll often hear him telling stories about his God-adventures while traveling to over 25 nations during his 20+ years of ministry. Johnny's been blessed with the opportunity to encourage government officials and presidents from many nations, as well as restore hope to countless people in impoverished areas through his prophetic gift. Worship with Steve Swanson will take us to the heavens as many have witnessed angels joining in singing audibly during his worship sessions, bringing great glory and power and carry you into the heavenly realms with his powerful and glorious worship music. Steve carries a powerful anointing and impartation in worship, intercession, and prophecy, which creates an atmosphere of breakthrough in worship and opens the heavens. Registration closes on January 9, 2019. PLEASE NOTE: Childcare is NOT available - if you are bringing children, they must also be registered and paid. They must be in your care at all times. This is our recommended hotel. Click Here for a full list of local hotels.